The award by the California Institute for Regenerative Medicine, or CIRM, will support the development of a treatment that will use patients' own skin cells to generate autologous induced pluripotent stem cells to derive retinal pigment epithelium cells, which are lost in many blinding eye conditions. The team, led by Dr. Steven Schwartz, will use the grant to drive the promising therapy to the next critical step toward a clinical trial in humans, submitting an investigational new drug application to the Food and Drug Administration. "We're grateful to CIRM and the people of California for this grant, which will allow our team to translate our research into a treatment for major causes of untreatable blindness such as macular degeneration," said Schwartz, Ahmanson professor of ophthalmology and chief of the retina division at the UCLA Stein Eye Institute. "This pivotal investment brings hope to countless patients and families suffering with blinding eye disease." Retinal diseases affecting the center of vision, also called maculopathies, are the leading cause of blindness in the developed world and affect more than 10 percent of the U.S. population over 65. The number of people affected by this untreatable group of disorders, such as age related and myopic macular degeneration, and Stargardt's macular dystrophy, is expected to increase to nearly 20 million in the nation by 2020. Although disorders in this group can have varied underlying causes, they are all linked to the deterioration of the layer of retinal pigment epithelium cells beneath the retina, which lines the inner surface of the back of the eye. These cells are critical to vision; they maintain function of light-sensitive cells called photoreceptors, or rods and cones. Without the retinal pigment epithelium cells, the rods and cones cannot survive. Ultimately, the deterioration of these cells leads to the loss of photoreceptors and eventually to blindness. The induced pluripotent stem cells maintain the genetic code of the individual from whom they originated. The cells also bear none of the hallmarks of age and instead appear much like very young cells. In the research, these induced pluripotent stem cells will be differentiated into a large volume of the patient's own retinal pigment epithelium cells — between 50,000 and 500,000 — which will then be surgically transplanted into their own retinas. Pre-clinical research suggests these new cells will integrate with the patients' remaining retinal pigment epithelium cells, rescue related eye tissue and spur regeneration of the surrounding tissue. Thus, these transplants may preserve or restore vision. Replacing retinal pigment epithelium cells lost to disease with the stem cell-based cells has already been tested in a first-of-its-kind clinical trial led by Schwartz. That trial showed that retinal pigment epithelium cell replacement strategies are safe and possibly effective in addressing retinal blindness. However, these earlier trials used cells created from human embryonic stem cells, which require that patients take drugs that suppress the immune system longer term so that their bodies do not reject the foreign cells. These immunosuppressive drugs carry substantial health risks, particularly for the elderly. 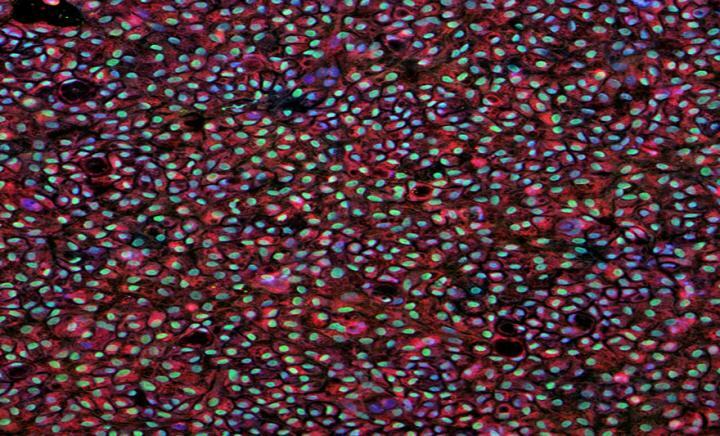 By creating retinal pigment epithelium cells from patient-derived induced pluripotent stem cells, the new method developed by Schwartz and his team should not pose a risk that the cell therapy will be rejected by the patient's immune system, thus likely eliminating the need for immune suppression. Because many maculopathies are age-related, this key improvement may make Schwartz's novel treatment more accessible to the individuals who need it most. Another difference between Schwartz's method and previously studied treatments is that the new retinal pigment epithelium cells will be delivered to patients suspended in liquid rather than on a scaffold. This makes it possible for the treatment to be administered in a minimally invasive transplant surgery, which reduces risks and provides faster recovery time. These two advantages open up the possibility of administering the cell therapy earlier in the course of macular diseases, when some functional tissue remains. Early intervention could be critical to the success of treatments for maculopathies because when diseased retinal pigment epithelium cells are lost, neighboring and essential tissues such as photoreceptors are compromised or disappear completely. "We hope this research will improve upon the methods studied in previous trials, which showed promise but came with drawbacks and risks," Schwartz said. "The project holds the possibility of developing a treatment that will preserve vision in patients with an early diagnosis, restore vision in patients with end-stage loss of vision, and carry fewer risks." Schwartz is developing this treatment in collaboration with a multi-disciplinary team comprised of stem cell biologists, ophthalmologists, retinal biologists, immunologists, transplant surgeons, bioengineers and regulatory experts. This group includes co-investigators Dr. Donald Kohn, professor of microbiology, immunology and molecular genetics, pediatrics and molecular and medical pharmacology; William Lowry, professor of molecular, cell and developmental biology; Jerome Zack, professor and chair of microbiology, immunology and molecular genetics; David Williams, professor of ophthalmology and neurobiology; Saravanan Karumbayaram, adjunct professor of microbiology, immunology and molecular genetics; and Zoran Galic, an associate professor of medicine, all members of the UCLA Broad Stem Cell Research Center; as well as Xiaoyang Wang, assistant professor of medicine and health services research. This research is supported by the California Institute for Regenerative Medicine-funded UCLA-UCI Alpha Stem Cell Clinic and the UCLA Broad Stem Cell Research Center. This includes previous support from the Esther B. O'Keeffe Foundation, the Jean Perkins Foundation and the UCLA department of ophthalmology, which has support from Research to Prevent Blindness Inc., Louis & Harold Price Foundation, Lavery Foundation, and the Smidt Family Foundation. The potential cell-based treatment for blinding retinal conditions is used in pre-clinical tests only and has not been tested in humans or approved by the Food and Drug Administration as safe and effective for use in humans.